When Tracie-Ann shared her breathtakingly beautiful plus size maternity photo shoot photos with me, I couldn’t help regretting not having my own maternity photos taken. The truth is that I didn’t realize how truly amazing I looked when I was pregnant. I was so focused on a belly that looked more like a “B” than a “D”. I couldn’t see my own beauty. I also didn’t realize that a great photographer can help you to recognize how stunning you really look! Over the past 5 years, I’ve pushed myself way beyond my comfort zone in an effort to connect with and love my plus size body. Between doing boudoir photography, and speaking to many photographers, I’ve picked up some tips on having a stress-free photo shoot. I can’t tell you how many women share with me the regret of not doing a plus size maternity photo shoot, so I hope these tips encourage you to take a risk and book a plus size maternity photo shoot for yourself right away! 1. Find the Right Photographer! Selecting the right photographer for a plus size maternity photo shoot goes well beyond scoping out their website, Instagram and Facebook pages. It starts with finding someone who is experienced in photographing plus size pregnant women. If you have a B belly or are still waiting for your bump to pop, you’ll want a photographer who is skilled at making your bump appear round and pronounced. With that said, if you love your B-shaped belly then celebrate it and have it photographed! It’s your photo shoot so be sure to tell your photographer the look you’re going for. There are many examples within the video below of over 200 plus size maternity photo shoots (and personal photos). When looking for an experienced photographer, ask your plus size friends for recommendations or review local photographers’ pages to find photos that you identify with. 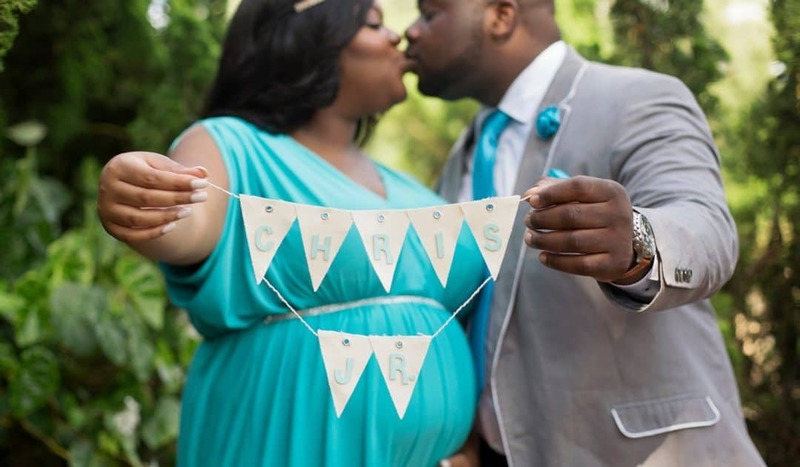 As we saw in Tracie-Ann’s glorious photos, she had a few adorable plus size maternity outfits. You’ll want to pick out your outfits well in advance so you’re not feeling frazzled the day of the photo shoot. Take a peek at the adorable options below. If you select the location in advance or have your photographer make some suggestions, you can envision where you’ll be and not feel anxious. I not only recommend a beautiful outdoor space like a public park with lovely scenery but also have some pictures taken at home where you feel most comfortable! Consider starting at home and in your nursery (if you already have it set up) and then venturing out and about somewhere beautiful. You want to be able to relax (as much as possible) and feel like you can be yourself during your plus size maternity photo shoot. Therefore, if you feel comfortable doing so, share any insecurities you have about your body with your photographer rather than focusing on them in your head while photos are being taken. You’ll also want to avoid doing anything you wouldn’t normally do, like putting on fake lashes if you don’t routinely do so. As I share within my article How to Look Perfect in a Picture, the more you’re able to just be you, the more your photos will shine!! Once you’ve found the right photographer, picked out the perfect outfit or outfits, selected a location that feels good to you, and have tried to relax…it’s time to just enjoy the experience. Smile! Laugh! Rub that beautiful belly and trust that your photographer will take good care of you. Remember these photos aren’t just for you and your partner to cherish, they are also for your child! I know you’re going to rock your plus size maternity photo shoot and I hope you’ll share your images with me via Instagram by sharing the #plusmommy hashtag. If you’d like even more tips, the recently published My Plus Size Pregnancy Guide has an entire chapter talking about plus size maternity photography and includes a template for e-mailing prospective photographers. I’d recommend checking it out since everything can’t be addressed within one blog post!